January 2005, Volume 2 Issue 1 Know It - Profit! 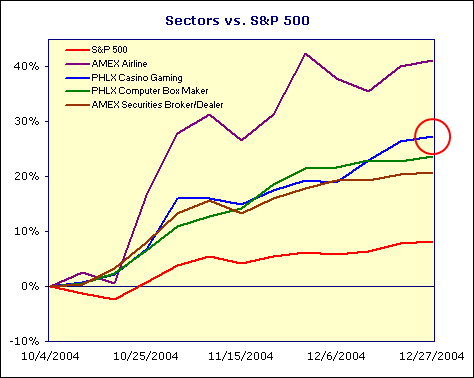 This month's issue looks at the strongest performing sectors in the fourth quarter of 2004. You may be surprised at what's taking off! I compared over 70 indices against the S&P 500 using the relative strength comparison method. The following four were the front runners for the last quarter: airlines, casino gaming, computer box makers and securities broker/dealers. The AMEX Airline Index really took off but was too erratic for my liking. Also, since this industry is so closely linked to the world oil markets... I'll pass on it. 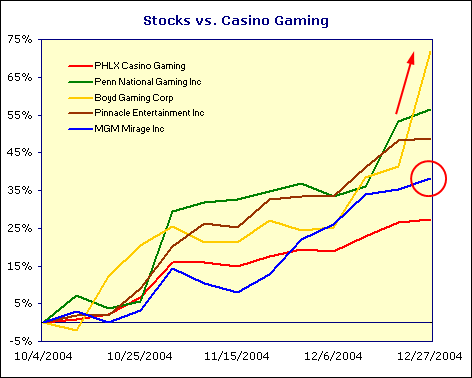 The PHLX Casino Gaming, PHLX Computer Box Maker and AMEX Securities Broker/Dealers indices showed solid growth over the quarter. Of the three, I believe the gaming industry is better positioned for sustained growth. A total of 20 stocks make-up the PHLX Casino Gaming index. Only a handful were considered. Boyd Gaming Corp was a high roller in mid-December posting an impressive 72 percent gain. Penn National Gaming Inc and Pinnacle Entertainment Inc were good bets with solid gains of 56 percent and 49 percent, respectively. MGM Mirage Inc had a modest gain of 38 percent... certainly not the best of the bunch but, deserving, nonetheless. We'll go with MGM Mirage Inc (MGM). Here's why. Although the other stocks showed stronger returns during the period, we'll discard them for the simple fact -- they're over-extended. All are in their fifth wave up... ready for a correction. 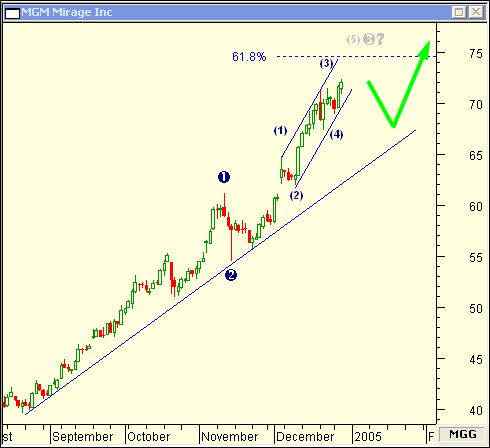 MGM is in a well established up-trend, starting from the August low. The stock is on the verge of completing a Minor Wave (5) of a larger Intermediate Wave ... coincident with the 61.8 percent extension from Wave . Once the price objective of $74.50 is hit, I expect MGM to correct down to the long-term trend line before trading up, again. In the November 2004 issue of Chart Wealth, I set a price objective of $14.25 for Oracle Corp (ORCL). On 12/13/2004, ORCL (View Chart) gapped-up to close at $14.63! Relative strength comparison analysis is an objective method for selecting stocks... but, don't use it by itself! Apply the Three Step Set-up and you'll have a robust stock-picking plan that will support your subjective analysis, nicely.